Hands down, my favorite Christmas tradition is putting up the tree. There’s just something about the smell of a beautiful evergreen mixed with the crisp winter air that really makes Christmas come alive for me. the sentiments are still there. At my parents home we have two trees. One is filled with antique glass balls that my great grandmother brought over from Germany. The other is filled with picture ornaments. And that is my favorite tree. You see, ever since my siblings and I were born, my mom has been collecting sets of picture ornaments for each year. So every Christmas, it’s fun to go and look at all the old childhood pictures and reminisce about the “good old days” … aka when Apple was simply “Macintosh computers” and kids still played in the woods after school. But anyways, this tree is truly a walk through history. And for someone who is in recovery from anorexia, that is both good and bad. You see, among those darling christmas photo ornaments showing childhood yearbook photos with missing teeth, and 90’s matching scrunchie/embroidered sweat suit outfits, there are a few ornaments that are not so endearing. Not so sweet. There are the photo ornaments of when I was in my disease. Photo ornaments where the girl smiling back is unrecognizable: gaunt, hollow, and lacking life behind her eyes. Those photo ornaments are a punch in the gut that remind me of the dark time, and the pain during my eating disorder. So over Thanksgiving when I was home, my mom and I were putting up the photo ornament tree. And when I unwrapped the first ornament, I had the wind knocked out of me. Becuase there, staring back at me, was ED-me. It made me catch my breath. It was a photo of a girl who I no longer am. A girl who has been left behind. And so I did something for the first time this year: I threw the ornament away. That girl is not me. I mean, it was, but not anymore. The girl hanging up these ornaments today is strong. Full of life. Full of love and hope. Firm in her recovery and alive in her faith. And I’ll be damned if I put that photo up to be “glorified” and celebrated on the photo tree. The girl in that photo has been laid to rest. She is not welcome on our tree of life. Our tree of love. Of family. Of joy. Of Christmas. We all have little things that remind us of pain. Or remind us of struggle, a failed relationship, a missed opportunity, a detour in life. I wanted to put the past in the past. Once and for all. The joy and freedom of the Now will not be infiltrated by any reminants of the Then. I’ll leave you with this little nugget from Collosians. Put on your new self, and be renewed as you learn to know your Creator and become like Him…Put to death, therefore, whatever belongs to your [old self]. You used to walk in these ways, in the life you once lived. But now you must also rid yourselves of all such things. Who I am today, decorating the tree, this is my new self. The self that has been restored and loved and forgiven by my loving Father in Heaven. My old self – my ED-self – has no place at our home or on our tree any longer. Cheers to our new selves. Curious. Have you ever read any of Elizabeth Elliott’s books? She had a traumatic life event and writes beautifully about God’s goodness. I’m new to your blog but already so loving it! Love your humor. Love your transparency. God is good!!! Aw, thank you so much!! Seriously, that means the world. 🙂 I’m glad our paths crossed and that you’re enjoying your times in my dusty little corner of the internet:) And yes He is! have a great night! hugs! Your was alive with reality. My daughter suffered with anorexia years ago and she still fights continually to stay healthy. Like you she refuses to go back. Prayers are with you. Thanks C! There really is no place like home at Christmas time…even though TBH it doesn’t quite feel like Christmas yet! Thanks for stopping by! hugs! Great post! Love your positive message, I’m happy for you! such a special time when the family is together:) have fun! This reminds me of giving away your old “sick” clothing. It’s getting rid of crap that doesn’t serve you and just takes up space. Just as those clothes are out of fashion and worn, those pictures are not worth keeping to remind you of who you are not. Thanks for sharing. It is so important for others who are struggling to hear of success and faith and grace. And your encouragement is a gift to them. Thank you so much 🙂 That is my deepest hope: That someone who needs encouragement in the midst of a struggle will find it here. Thanks for this nugget of positivity 🙂 blessings to you! Oh yeahhhhh! 😎😎😎🎄 thanks for stopping by! BBB, I’m happy for your change on Life and the new you, you have become. I know it couldn’t have been easy, but you did it anyway. Good for you. By the way, from what I can see from the photo you have…(I’m guessing of yourself) you are a very lovely young lady. Hi Jim! Thank you so much. Recovery has definitely been a journey, but it is one I am grateful for everyday. And yes, that’s yours truly! Haha thank you for that ☺️ glad you stopped by! Have a great night! Your strength is so poignant here. How wonderful that you are not that girl. You must be so proud of your growth. Hi Joey! Haha cats 🙄 always know just how to push our buttons! Thank tou for such kind words. I am very grateful to be out of that place. That’s for sure. Thanks for stopping by! Have a nice evening! Hugs! Thank you for sharing so boldly and beautifully. Praise God from whom all blessings flow! P.S. Love your pics! So expressive and creative! “The girl in that photo has been laid to rest. She is not welcome on our tree of life. Our tree of love. Of family. Of joy. Of Christmas.” — I can certainly understand your thinking on this. However, the disease, the eating disorder, has been laid to rest. The girl in the picture ornament has been made whole by the healing grace of the One whom we celebrate with our lovely Christmas trees. It can be difficult, sad, and heart-wrenching to see ourselves in the poor state we once were. And I will be the last one to question your decision to toss that reminder in the trash. I have yet to completely accomplish that. Your family loved you more than you will know during that terrible time. And they love you now that you are recovered. I would leave you with the following, “Heal the wound but leave the scar. A reminder of how merciful You are.” — From the song Heal The Wound by Point Of Grace. “I think everything happens in God’s timing. And I’m glad that YOU were the one throwing it away, because through the eyes of a mother, there’s NO stage in any child’s life that you want to leave behind because we love you fiercely through ALL of them. I completely understand and celebrate your decision to get rid of it, but it is rightfully your place to do so. I have loved you everyday….good ones and bad ones. And yes…publish this. It is raw and beautiful. I think I felt so strongly about throwing it away, not because i was getting rid of the girl in the photo, or ashamed of the girl in the photo, but that I was getting rid of ED, who was completely controlling me when that photo was taken. ED had taken residence in my soul. Truly. And, you’re so right — it was Jesus who saved me and rescued me from ED’s grip. So I was throwing away ED…not me 🙂 God, and my family, loved me, as my mom said-fiercely- through all of it, and didn’t think I needed to be “thrown out.” It was part of me, and none of that deserves the garbage can. I was just tossing ED out, because when I see that photo, I don’t even see me…all I see is ED’s decrepit hands around my life. Your reply put a tear of gladness in my eye! I am so happy for you. And thank God for Moms who understand and support our decisions. You are so very welcome–God bless you! Thank you so much, Gina. I agree. Christmas is for joy and family. Merry Christmas to you and yours too! It hard to believe that we’re less than a month away! Where did time go?!! Hugs! Dear Beauty, you have again written a masterful narrative regarding your overcoming in the name of Jesus. Lizzy and your mom have made wonderful comment of support which basically mean, “do what you want to.” That’s freedom! Neither keeping nor throwing away is the “right” thing to do. Being free to do either is your call. I understand and I’m sure Lizzy and your mom do to. Thank you so much Oneta:) you’re right. They brought up a great point. 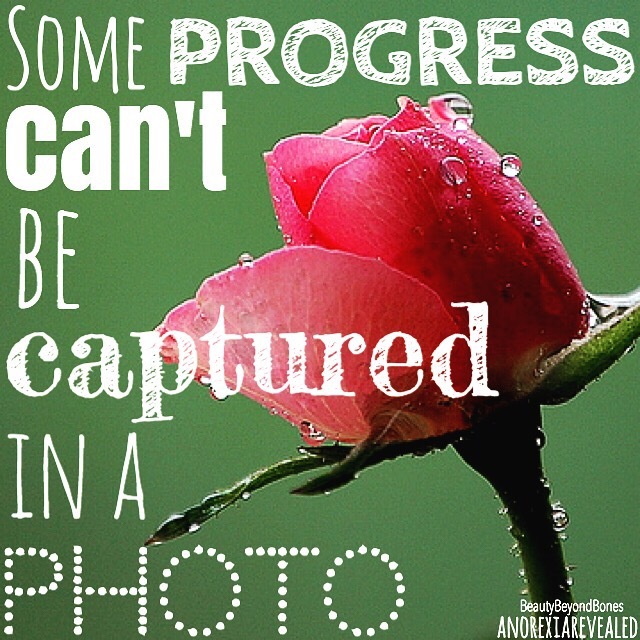 It was so affirming to hear that, especially from my mom that she would not have thrown the photo away. I mean, I knew that in my heart, but just hearing her verbalized it was touching. I have really been blessed with amazing parents. I am grateful for that every day. Thanks for reading and for taking the time to respond! Hey! Thank you for reblogging:) I hope you’re having a great Wednesday! Time is just flying by, isn’t it? Hugs! What I most love is to sing carols around a Christmas tree. Not enough people have experienced that. It is wonderful. Hi Harry! Oh my, that does sound amazing. I love singing carols as well. When I was younger my friends would go door to door singing carols – it was such a special time. Thanks for stopping by! Blessings! Oh Lisa, thank you so much:) that’s a really great way to look at it! Thanks! Happy Christmas to you! (I can’t believe it’s already that time of year to say that again!!!) thanks for stopping by! Oh, thank you Anna! Thats really kind of you to say 🙂 Have a wonderful afternoon! hugs! You too! For so many reasons your post really struck a chord with me. All the best! Food for thought… Never, ever be ashamed or afraid of your former self. For just as Christ defeated or conquered sin on our behalf, you have defeated or conquered your former self. To deny it presence in your life is akin to fear and anxiety. It may have controlled you for some time, however, YOU defeated it and now live in the present and are moving forward. Every challenge or fear I faced (and triumphed) over) in my life, I did so looking it squarely in the eye without flinching or blinking, steadfast with resolve and confidence of my victory… Forgetting about our former selves is also illustrative of not having the “scars” to remind us where we came from nor as our “badge” of victory as human beings…. Wear those memories like a Crown and a Queen for it is now whom you have become! Thank you for this wonderful perspective, MW. I appreciate such a thoughtful response. You’re right: with Christ I was victorious over that darkness and should celebrate that triumph. And I do. Every meal I eat, every time I put on an article of clothing that fits properly, every time I go out with my friends, those are all reminders of my victory. I guess I just didn’t want to have that skeletal face staring at me on the tree during such a joyous occasion. But I completely agree, it is good to have reminders of how far we’ve come. Thanks for stopping by and for giving me a fresh perspective on this 🙂 and also: congrats to you for triumphing over the challenges in your life too:) hugs to you! Hi Cm! Oh yes I’m a big lover of the xmas tree! That sounds really pretty! Plus it’s on the table so it’s easier to admire! ☺️ thank for stopping by! Hi John! thank you so much 🙂 wow an angel AND a star! How awesome! 👍👍 my little niece would love that! And I agree. One of my favorite traditions is driving around and looking at all the Christmas light on Christmas Eve. Yep, I had to get rid of that painful reminder. It had no place in our celebration. Thanks for stopping by and for sharing your wise perspective:) I’m grateful for you! Blessings! There’s a certain kind of honesty and optimism in your writing that I find refreshing. I understand that you have come past a phase in life that you no longer wish to recall. I totally respect your decision. Much love. Though we don’t really do Christmas where I come from (I know), Merry Christmas! Do feel free to visit my blog as and when you can. Hi there! Thank you so much for this kind note and for taking the time to read! I appreciate your encouragement. 🙂 and yes, that is me 😊 thanks for that☺️ I look forward to checking out your blog! Have a lovely Christmas season! Blessings and love to you and yours! Hugs! Good for you!!! I don’t know why it’s so hard to throw things away that remind us of difficult times. But it’s so therapeutic to do so. Thank you so much! You’re right, SO therapeutic. Something about physically tossing something out really solidifies moving on. Thanks for stopping by! Hugs! I am glad that you are claiming the ‘you’ that God intended you to be. I think when we come to faith in Christ, we put on the new self and then grow into it. I had many behavioral struggles as a teenager that I was very ashamed of. For a long time, I dissociated from the little girl that lived them and I think maybe, I needed to do that for a time and learn an entirely new way to live but greater healing for me came when I embraced her and gave her the love she needed and desperately tried to fill by some very bad methods. I’m not her but she is part of me and I’m not ashamed of her anymore. Together, we left those old coping methods behind and live a better life. God completely fills my every need and I’m no longer driven toward the self-destructive acts that the child I was sought relief from. I see you getting stronger with each post. God bless and keep you, always. Hi Pam, thank you so much for this beautiful note. Seriously. Your words are wise, and supportive and mean so much. How wonderful that you’re embracing and showing love to your old self love. That is so inspiring. And sounds so incredibly healing. I’m definitely on a journey, and that is the ultimate destination. God is good and I know that He strengthens me every day. Thanks for stopping by and for your kind words! Hugs and blessings to you! Thank you so much! Same to you❤️💚❤️💚❤️ glad you stopped by! My pleasure. Thank you for your hard work and amazing Blog, God Bless You. This is the post that got to me. The words resonated but it was the memes that prompted a comment because I’ve included those same thoughts on my posts. The journey has been long, & it is tiring. I feel like I’m thinking & writing jibberish at the moment but just wanted to say whether we are batting an ED or Autoimmune issues or whatever, Jesus is what counts. We can depend on Him. Hi Kenzel! Thank you so much for this beautiful comment. You are so so so right. Jesus is what counts. We owe everything to him. Also, I don’t know if you have an autoimmune disease, but I have ul arrive colitis, so I can definitely relate. It’s A comfort to know we are always in His hands. Thanks for stopping by. Hugs and blessings to you and yours! I do have AI issues…Hypothyroid/Hashimotos/Leaky gut & Adrenal stuff…that’s just the stuff I know about! For clarification, were u referring to ulcerative colitis? This was a beautiful post. Congrats on your new self! Beautiful post. Amazing sentiment. Heartwarming. Thank you so much Rareity. I appreciate your kind and encouraging words! I’m glad you enjoyed it. Thanks for stopping by! Hugs! Love this piece. 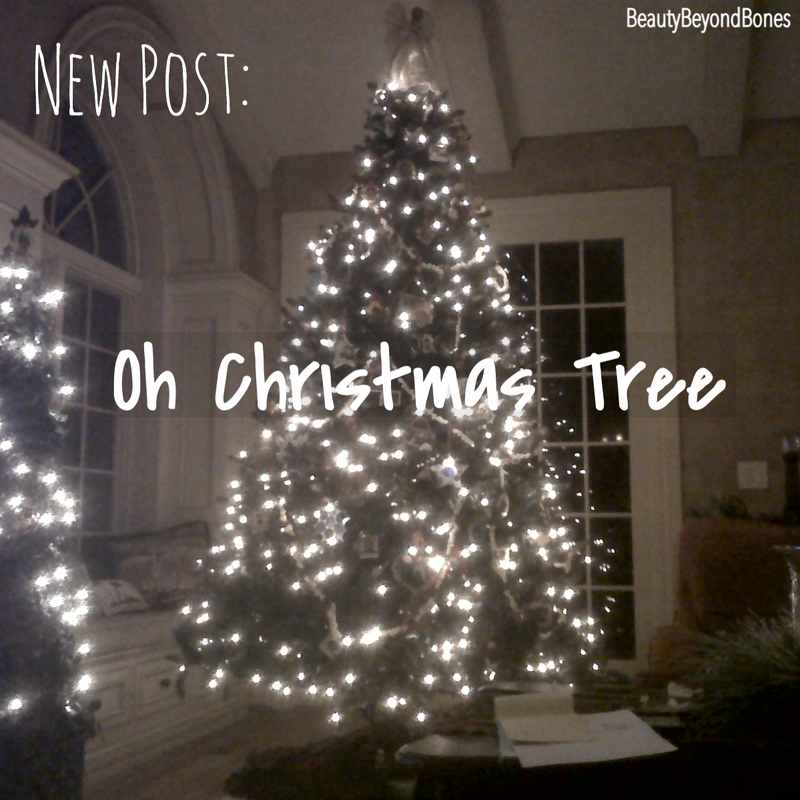 I just finished a post about the adoration I have for my tree, and while I took a much different (mom) angle, I applaud you for talking about the tough stuff. Beautiful declaration of moving forward! Wow. What a fabulous post. I love that you were able to throw away that old picture ornament and encourage, celebrate and love the new self that you are and honor God in how He’s healed/healing you. So important to put the past where it belongs, in the past and let the old self die and rest in peace. That is not an easy thing to do; the past is a tenacious, voracious beast, not easily defeated. Really enjoyed this one! Peace out! Thank you so much! You’re so right, the past needs to stay in the past so we can focus on the future. focus on hope and new beginnings. And yes, God is so incredibly good and merciful. I am so grateful for His healing every single day. Blessings and love to you! Thanks for stopping by! Grateful to have stumbled upon your site…and since it happened on Christmas Day, I’d like to consider it as a gift. Thank you for this.